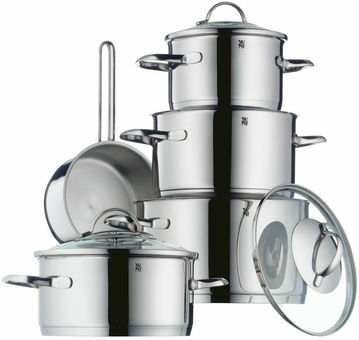 Consisting of a low casserole, a high casserole and a saucepan, this WMF set is a great basic set of versatile cookware. The low casserole is perfect for delicious stews and juicy roulades. The high casserole is ideal for anything that needs more liquid for cooking. Pasta, potatoes and dumplings are no problem for this capacious pot, which is even roomy enough for large vegetables like cauliflower. The saucepan is ideal for small quantities, for heating milk and soups, for reducing sauces, and whipping up custards and puddings. All three pans are suitable for induction hobs and can be put in the dishwasher for cleaning. Welcome to a new world of cooking pleasure! The pots in the WMF Provence Plus series with their see-through lids are ideal for energy-saving cooking without using much water. The Cromargan® cookware has great functional properties. The high-quality stainless steel Cromargan® is robust, resistant to scratches and bumps, has a neutral taste, is easy to maintain, dishwasher-safe and absolutely hygienic. Every detail on the pot has been thought through and they have a TransTherm universal base that is suitable for all hob types, including induction hobs. The ergonomically designed handles, made of satin finish stainless steel and with a modern design, suit every kitchen. The wide rim ensures that the contents are poured out neatly.